I never really believed or understood until now. That is, I never understood why it took others decades to build a basement-filling model railroad. I had read about the process and procedures for, well, decades. It seemed straightforward enough. Open grid benchwork is simple, you can build several sections in a day, no? Ripping plywood for the subroadbed is only slightly more complicated; and flextrack should go down 1-2-3, right? Looking back almost three years after starting actual construction of the railroad, I still can't point to a single reason why all of the above is not true. I can point to dozens of reasons. Some of them are my own fault, some are due to circumstances and some of them just are. 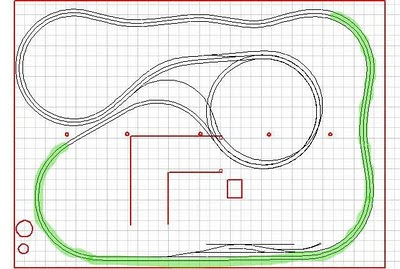 The parts of the track plan highlighted in green are what I have accomplished since starting in the spring of 2007. Have I worked on the layout every available moment since the beginning? No. In 2007, part of the straightaway at the bottom was completed in between preparing for a major overseas trip. 2008 was the most productive year, I finished the bottom portion and constructed the first turn and S-curves to the right in a burst of activity from late July through Christmas. 2009 was dismal with only the curve at the lower left completed by Feb. of 2010; although a change of jobs partially accounted for the lack of progress. Part of the problem resides with me. Reading about how to build a model railroad and actually doing it are two different things. So I work slowly and carefully. The plodding pace of work has been exacerbated by the Lords of Model Railroading offering their sage wisdom in the various magazines about how benchwork and trackwork and couplers must be perfect and woe will befall you if it is not so. Of course, all of these experts are working in the smaller scales where a millimeter of error is more important than it is in O Scale. I also hate - hate - hate doing things over; I consider it to be the ultimate waste of time and money. As a result I spend more time planning and working slowly. For all of the time it has taken, my track does seem to be smooth running. All of the equipment that I have run so far shows no wiggles as it passes over track joints, over the bridge and between sections of the benchwork. Circumstances also contribute to the slow pace of work. The one that I run into most often is that I never have all of the materials at hand to finish a task in one sitting. It seems that no matter how much you plan in advance, you're always short on something. For example, the weekend that you plan on building the next section of benchwork, neither Home Depot nor Lowes will have a good selection of dimensional lumber. Or after returning from he home center I've run short of one or two bolts to attach the legs. And what about the O Scale items that you cannot get at the local hobby shop: 2-rail O scale track, roadbed, even rail joiners; if you run short on these, snail mail is your only option. Then there are the things are involved with building a basement-filling model railroad. For example, there are thousands of parts to fabricate and thousands of operations to perform. Consider the simple task of building raisers for the roadbed, each has two pieces of wood to cut, four holes to drill and two screws and gluing. About ten operations for each one and there are hundreds to be built. Track wiring is similar, hundreds of feeders each having to be cut and soldered. And I haven't even started on scenery and structures. Am I unhappy about all of this? Yes and No. Yes I am frustrated with the pace of the work and I wish that I had been able to follow John Armstrong's advice to get the mainline into operation early; but the geometry of the track plan and the basement does not allow for that. But no, there is tremendous satisfaction in doing a job and doing it well; and I will not compromise by dong something 'temporary' because they have a way of becoming permanent. I put in temporary bus wiring for the first several sections of benchwork and now I am reluctant to go back and fix it; I'll not repeat that mistake.